How to Reach: Lonavala can be easily reached from anywhere in Maharashtra by hiring local transport like a taxi or a train. Nestled in the Sahyadri ranges of western India is a quaint little hill station, called Lonavala. It is situated in the Pune district in Maharashtra. The sheer serenity and charm this place exudes is beyond description in words. Its proximity to two of Maharashtra’s main commercial cities (Mumbai and Pune) makes it easier to reach. 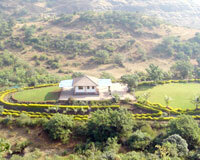 Many people travel to Lonavala to rejuvenate and take a break from the hectic city life. This lovely place attracts tourism due to its hospitable climate, which remains pleasant throughout the year. The total population of this place is around 50,000, which makes it peaceful and devoid of the concrete jungle. During the monsoons, Lonavla turns magical as the rains freshen up the environment, making everything clean and lush green. The place derives its name from the Sanskrit word, "lonavali", which means surrounded with caves. Lonavala has many historic caves like Karla Caves, Bhaja Caves and Bedsa that are popular tourist attractions. Lonavala is blessed with lush green hills, steep valleys and gushing waterfalls. This makes it the ideal vacation spot for all those who are tired of the stressful city life and want to take a break. Just a few minutes from Lonavala is its twin hill station, Khandala. Together, they make an ideal vacation paradise for travel lovers, photographers, newly-weds and families! For the benefit of people, there are many hotels and lodges that provide comfortable accommodation at reasonable costs. What more are you waiting for? Just pack your bags and come here to discover the simple pleasures of life!